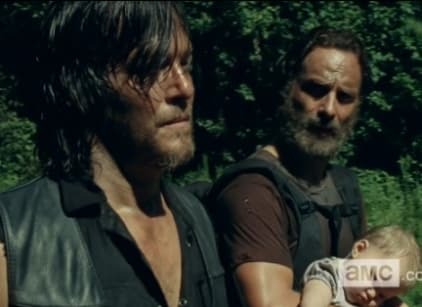 Rick and the survivors travel to Virginia to find Noah’s family. They discover the place is in ruins and bodies are everywhere, including ones chopped into pieces. Rick, Glenn and Michonne gather supplies, while Tyreese watches over a grieving Noah. Michonne talks about going to D.C., and Rick agrees. Noah runs to his old home and Tyreese follows. Inside they find Noah’s mother. Tyreese checks out some photos and is bitten by a walker. Tyreese begins to hallucinate people like Bob, Beth, The Governor and hear of “news” reports on the radio. Noah manages to get to Rick, Glenn and Michonne who are able to chop off Tyreese’s bitten arm. Unfortuantely, Tyreese dies as they try to get him back to the rest of the group. It went the way it had to. Permalink: It went the way it had to. Don't you want one more day with a chance? Permalink: Don't you want one more day with a chance?